Handmade items with you in mind! I specialize in pillow cases, fabric photo albums, earring boards and much more! Check it out! Hello everyone, haven't been blogging lately. Today we finally bought new linoleum for the kitchen We are finally fixing the place, little by little. Trying to make it more 'me'. 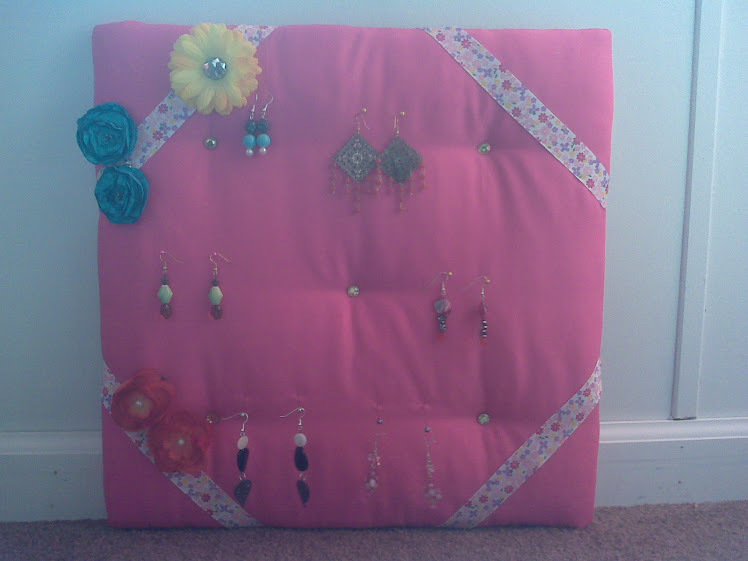 I've also been working on some custom earring boards. I personally love the way the first one came out. Just need to put the finishing touches and send it off to the proud owner. Then on to my next customer request. Hopefully, that one comes out just as good and she'll love it. Its difficult to do custom ones since you worry if they're going to like it or not. Well, I'm off for today. Have a good night! This was my gift to a little friend. Made this for my son. I have a full time job outside and inside the home. I love to spend 'me' time creating different projects. My first love is painting. I enjoy making fabric photo albums and recently started sewing. I recently got interested in decoupaging. Let's see what my imagination creates! CraftyCreationsbyCyndiB. Awesome Inc. theme. Theme images by enjoynz. Powered by Blogger.